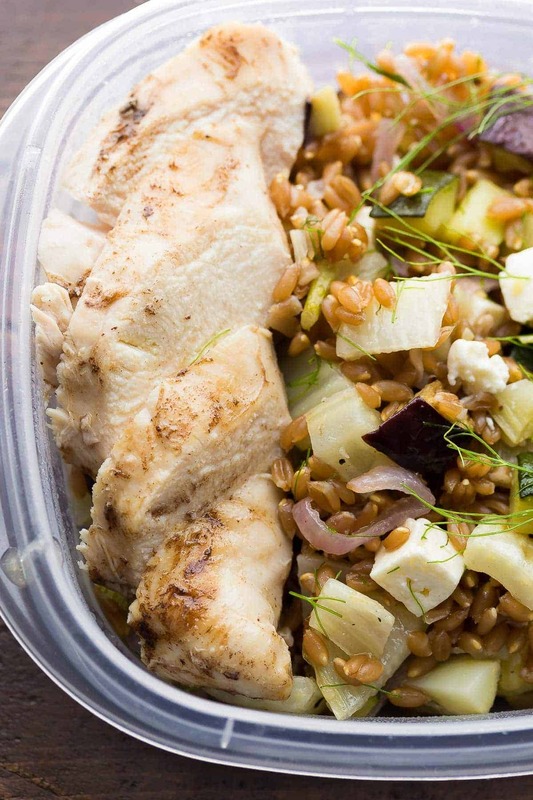 Mediterranean farro chicken lunch bowl recipe is filled with roasted chicken and veggies tossed in balsamic and sprinkled with feta cheese. I am so grateful for this blog…it has taken me SO much father than I had ever dreamed. Not only is it my full time job now (pinch me please, is this real life? ), but I have learned so much about food, become more adventurous in trying new recipes, and discovered some amazing new ingredients I would never have dared try in my former life. Last month I was proclaiming my love for steel cut oats, and now here I am proclaiming my newfound love for farro. It is seriously my new favorite grain to use in make ahead lunch bowls. 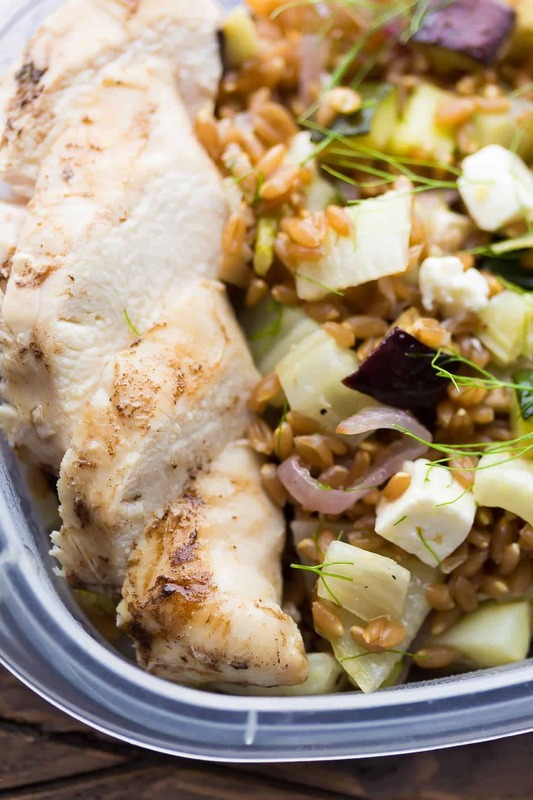 And today I have a great new recipe for you to use it in: this Mediterranean chicken farro lunch bowl recipe. Why do I love farro so? It’s all about the texture. They chewy, delicious texture. It doesn’t hurt that it is extremely filling. For this chicken lunch bowl recipe, I channeled some Mediterranean flavors by roasting eggplant, zucchini and fennel. Oh my goodness me, roasted fennel is also going on my list of newfound loves. 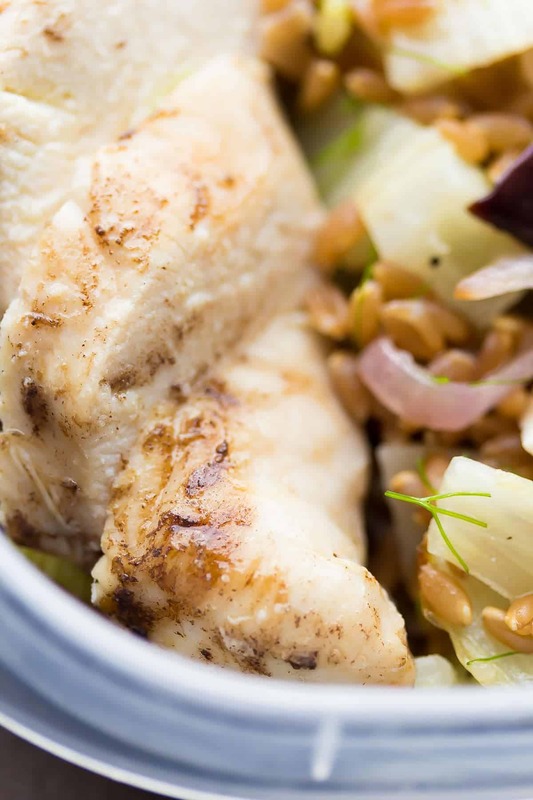 It gets slightly sweet, has a great texture and is oh-so-good in this Mediterranean farro chicken lunch bowl recipe. I roasted up the veggies in balsamic vinegar, along with a couple of chicken breasts. Then everything gets tossed in a tangy balsamic vinaigrette along with feta cheese. While the cheese is shown cubed in the photos, make sure you crumble it. Small but important detail for maximum feta cheese dispersal. The final delicious detail? Some of the fronds from the fennel, which have the fresh, anisey herb flavor, and the PERFECT compliment to feta and balsamic vinegar. 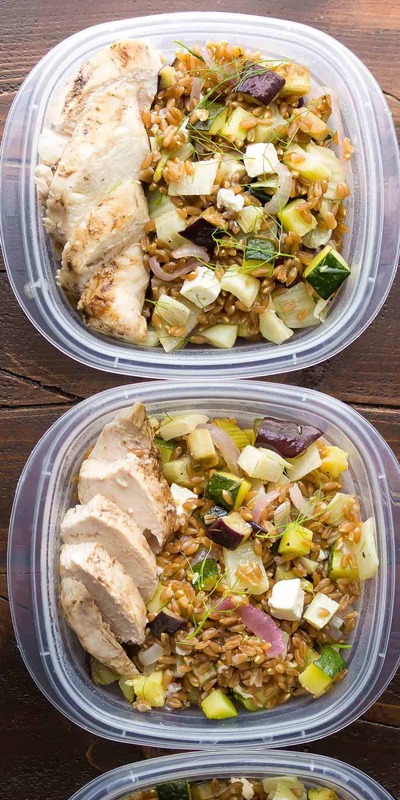 This Mediterranean farro chicken lunch bowl recipe will DEFINITELY give you something to look forward to at lunch, and they keep you full for longer. Yay! Toss the eggplant, zucchini and fennel in the olive oil and balsamic vinegar, then spread them out on a large parchment-lined baking sheet. Sprinkle with salt and pepper. Add to the oven with the chicken. The fennel is tender but still has some bite to it. If you want the texture to be softer, be sure to slice the fennel thinly. I made this and the flavor was a little heavy handed, to be honest. In reading the instructions there is a mention of apple cider vinegar, but the ingredient list does not include apple cider vinegar. Was that intended to be used roasting veggies instead of balsamic? I think that would have made a big difference. Also, did you get your fennel to roast in the same time as your eggplant? My eggplant seemed to be overdone and my fennel was underdone. The concept of this dish seems delicious, but I just couldn’t replicate it! Sorry for the confusion Megan! It was indeed meant to be tossed in the balsamic vinegar, but it says apple cider vinegar in the directions. I’ll update. My original run-through was with ACV and it was really bland, so the second time I made it with the balsamic vinegar and the flavor was much more to my taste. Sorry you found it too heavy handed, you could definitely mellow it out by roasting in the ACV if you make it again. I have never had Fennel before and am nervous I won’t like it, thus it ruin the dish for me! What would you compare this flavor to? Is there anything you recommend replacing it with? Thanks! Hi Lauren! Fennel has a slightly licorice flavor, and when it’s roasted it gets kind of sweet? If you’re worried about it, just replace it with bell peppers. They won’t have the same flavor as fennel but they’ll be good in the recipe! I hope you enjoy it! I need to hop on the farro bandwagon! I mean, these bowls are absolute STUNNERS! I could totally see myself making these and bringing them for school lunches with me every.single.day. I really love your beautiful make-ahead lunch ideas, Denise! I would definitely give people ‘lunch envy’ with this one. Love how easy it is to prepare, too – not hard at all! I just cooked up some farro a few hours ago! The chewy texture really is amazing. And I feel the same way about blogging, it has opened my eyes to so many different foods and cuisines that I would have never considered before. I would have missed out on so many delicious things! Yessssss to farro! It is my very favorite! You just cannot beat the chewiness! I am loving these bowls – between the farro … the roasted veggies … that dressing! Yes please! I am definitely (slowly) getting more adventurous too, thanks to the blog! I’mm thankful for your blog because otherwise we never would have met 😉 I will admit, I’ve never tried farro but I think I need to! The perfect hearty grain to keep us going through the winter! Aww I am so glad to have you as a blogging buddy 🙂 And we get to meet in real life again soon! 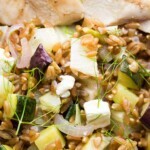 You should give farro a try, it’s got such a cool texture! 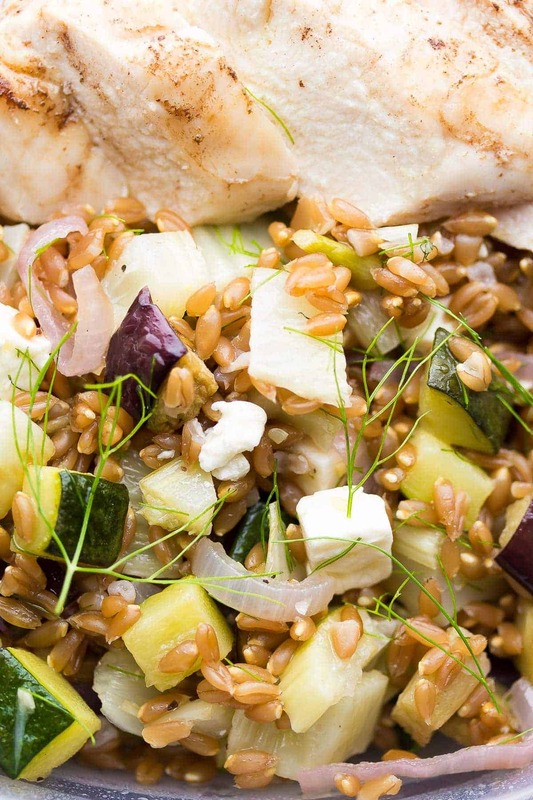 I can’t get enough farro — it’s one of my go-to’s right along with quinoa! These bowls look delicious and I love these Mediterranean flavors! Yeah!! I’m going to be on team farro for awhile now. Thanks, Marcie! I can honestly say that I’ve never tried farro before. But it looks so good in these lunch bowls. I never make breakfast for myself because I’m always working on this or that, but these would be perfect for lunch. And my hubby could take one too. Gotta get these made asap! Thanks Cyndi, they are so tasty!